Tidepool announced this morning that it plans to submit the DIY Loop app to FDA, paving a new regulatory path for automated insulin delivery (AID). Loop will be made available as an officially supported, FDA-regulated mobile app on the iOS App store, rather than the current DIY version that only works with out-of-warranty Medtronic pumps. Tidepool Loop aims to be compatible with commercially available interoperable insulin pumps (iPumps) and CGMs (iCGMs). No launch timeline was shared; we guessed “~2-4 years,” though if things go well perhaps it would be sooner. We acknowledge that’s a very wide range; it’ll be interesting to see how FDA’s CDRH assesses Tidepool’s proposal and what the process is. Tidepool has begun FDA discussions, and the current thinking is to submit Loop under a de novo iAlgorithm/iController pathway, allowing users to download the Loop app and run AID from their own iPhone with whatever interoperable, compatible pump and CGM they choose to use and is available. This would be the ultimate realization of FDA's Dr. Courtney Lias’ vision for component-based, mix-and-match, plug-and-play, smartphone-focused AID systems. Tidepool is working with pump/CGM companies already, leveraging its experience in diabetes data and now-rapidly expanding regulatory experience as a pilot participant in FDA’s Digital Health PreCert program. An observational study, starting in November, aims to enroll ~150-300 current Loop users, collecting real-world safety and efficacy data to support Tidepool’s regulatory submission. The Jaeb-coordinated study has been generously funded through a $1.5 million grant from the Helmsley Charitable Trust. We aren’t sure how many other funds will need to be raised but we imagine there will be significant interest, particularly with the “halo” effect of HCT. Recruitment will be limited to existing/new Loop users, with primary endpoints focused on safety/efficacy. Tidepool has hired Loop project lead Pete Schwamb and LoopDocs support hero Katie DiSimone full-time to help with this effort. Tidepool believes it will need to roughly double the size of its team, and it will accordingly raise money through grant-making organizations, device and healthcare companies, and individual donors. This news has major implications for the future of AID, opening up a new regulatory and commercialization pathway – three individual, interoperable components, rather than a complete “system.” For pump and CGM companies, Tidepool brings more impetus to obtain iPump/iCGM designation, along with another compelling option to launch with automation (once approved): make your device compatible with Loop, instead of internally building/submitting your own AID system. This news has major implications for the future of automated insulin delivery, including for patient choice (ability to mix-and-match AID components, bolus from phone), for how companies choose to develop AID products (build AID systems in-house/partnership vs. supply interoperable components that work with Loop), and for the regulatory path in AID (iController, dosing direct from the iPhone/Watch). “It would be premature and irresponsible to set precise expectations for a date. Demonstrating safety, usability, and efficacy are going to be paramount for this to be successful. That said, I hope it is sooner than your estimates. We have a big head start, because Loop exists today and is being used by likely over 1,000 people. The FDA is supportive of using real world evidence of existing Loopers to show safety and efficacy.” We aren’t sure whether he means sooner than the more ambitious two-year estimate or the conservative four-year estimate. A soon-to-start observational study aims to enroll ~150-300 current Loop users, collecting real-world safety and efficacy data to support Tidepool’s regulatory submission. The Jaeb-coordinated study aims to start in November and has been generously funded through a $1.5 million grant from the Helmsley Charitable Trust. Wow! Recruitment will be limited to existing/new Loop users, of which we believe that are close to 2,000 globally, if not more – obviously there is no registry. Primary endpoints will be safety and efficacy (presumably leveraging CGM data and perhaps still including A1c), with secondary endpoints focused on psychosocial outcomes on Loop – it’s great to hear the focus on patient-reported outcomes and we hope to see some standardization here in measuring, collecting, and reporting this data. The study will not have a control group, which actually makes it similar to the MiniMed 670G pivotal trial! The primary analysis will be conducted after six months, and additional data will be collected at one year and the study’s end. Adam's experience wearing Loop for more than two years is summarized below (Kelly also wore it for a period of some months but the old Medtronic pump kept breaking). Tidepool has begun conversations with FDA on Loop, including a pre-submission and multiple in-person meetings – download all of the FDA interactions from Tidepool’s website here, including the approved meeting minutes. It’s valuable for the field and as far as we know, actually unprecedented that Tidepool is posting everything so openly! As a nonprofit, there is a clear incentive to help others who may be in a similar situation. Mr. Look told us the team is “considering” an iAlgorithm/iController de novo application for Loop, following Dexcom’s G6 iCGM and Tandem’s iPump plans. Of course, Tidepool is also a pilot participant in the FDA’s high-profile Digital Health Software Precertification Pilot Program, and today’s blog post notes Loop will be a “pressure test for new regulatory evaluation processes that are being developed.” It is extremely notable that Tidepool is a pilot participant in this program, alongside giants like Apple, J&J, Roche, Fitbit, etc. That Tidepool is the first to take a step like this is also extraordinary and no doubt many eyes will be on this process. The FDA had a major incentive to get the first “artificial pancreas” approved with Medtronic’s 670G, and openly shared that the FDA leaders and staff worked many nights and weekends to get it done – we wonder what the approach will be in this case, particularly given that unlike the 670G, patients are using this approach to insulin delivery that is unregulated. While we personally know so many who have approached it with ease, this may not be the case for everyone, particularly if patients are limited on time, resources, technical savvy, etc. Tidepool is working closely with pump vendors on their “iPump” capabilities. The Tidepool Loop app is expected to be compatible “with at least one, and hopefully many more commercial, in-warranty insulin pumps.” Tandem is an obvious candidate here (see its Analyst Meeting plans to submit as an iPump), as are JDRF’s four open protocol pump partners – Roche, Sooil, Ypsomed, and SFC Fluidics. Tidepool Loop will work with iCGMs too, which is only Dexcom’s G6 for now but potentially others in the future; Senseonics should meet the accuracy bar but has not shared recent plans to submit as an iCGM (perhaps its goal is a 180-day indication before iCGM?). Tidepool has hired Loop project lead Pete Schwamb and LoopDocs online documentation and support hero Katie DiSimone full-time to help with this effort. Both are tremendously well respected in the DIY community and are spectacular additions to the non-profit’s team. Tidepool believes it will need to roughly double the size of its team, and its jobs page lists ten open positions now. More will be added as the project progresses. Over time, Tidepool will build an Android version of Loop, though iPhone/Apple Watch is the obvious initial goal. We assume building and testing Android would be quite a bit of work, so this probably at least a year beyond the iPhone version and likely longer. True to its founding, Tidepool plans to share everything it does openly, including all of interactions with the FDA, its quality system, Loop’s source code, and its project plans – see its documents page here. This is incredibly valuable! “We hope that this will help other companies and projects going forward,” asserted Mr. Look, and indeed, the interactions seem like they could be incredibly valuable for the field. We see today’s news as an enormously positive development for the entire diabetes technology field and for people with diabetes. This marks the first real move towards FDA regulation and commercialization of a DIY open-source AID algorithm, with many significant competitive implications highlighted below. This also could represent a disruptor to the established path of launching and commercializing AID, with major strategic consequences for companies. What Could Tidepool Loop Mean for Industry? What is Loop? We have covered the DIY system ever since we saw it at Diabetes Mine’s 2016 Innovation Summit; Adam and Kelly have cumulatively worn Loop for more than two years, and some of our pro/con observations are shared below. Loop is an automated insulin delivery app for iPhone that connects to an insulin pump and CGM using Bluetooth LE. Currently Loop needs a RileyLink box, a small communication bridge that allows the iPhone to communicate with old Medtronic pumps (converting Bluetooth LE to the 900 MHz protocol used by older Medtronic pumps; obviously this wouldn’t be needed in the iPump/iCGM world of Tidepool’s Loop). Loop runs an algorithm every five minutes to adjust basal rates for the next 30 minutes (temp basal rates, in case phone communication is lost). It’s a hybrid closed loop and still requires mealtime boluses, though the basal modulation’s aggressiveness can be customized – e.g., Adam’s is set to target 90-110 mg/dl and up to a 4.5x increase in basal rate, which can cover missed boluses for smaller-carb meals. 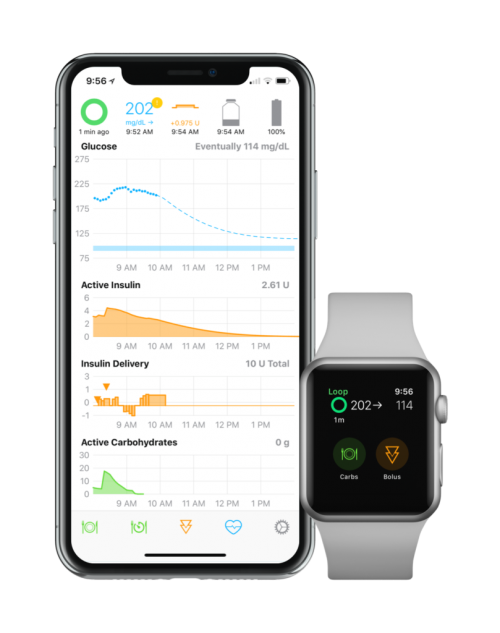 Loop provides user interfaces to bolus/engage with the system from both the iPhone and Apple Watch, including for carb entries, blood glucose corrections, and blood glucose temporary targets. Tidepool estimates that 1,000-1,500 people are using Loop as a do-it-yourself project today; we wonder if this is an underestimate, as presumably some single branches of code are copied onto multiple users’ phones. See this 2015 Medium Blog Post from Loop creator Nate Racklyeft and our initial 2016 coverage from DiabetesMine. While the current Loop setup uses a RileyLink ($150) to bridge Bluetooth to RF communication, this will be eliminated in the commercial Tidepool version (i.e., Tidepool Loop will only work with Bluetooth LE capable iPumps).The RileyLink allows the iPhone app to send commands to the old Medtronic pumps, turning Bluetooth into RF. This won’t be needed in the commercial version, since the vision is to connect the Loop iPhone app directly to Bluetooth-enabled iPumps and iCGMs. In other words, all someone would need to run closed loop is their pump, on-body CGM sensor, and Loop iPhone app. We assume the iCGM app will still need to be running separately, just as it does in the current version of Loop. Not having to carry around the RileyLink will be a major benefit to some patients like Kelly who sometimes lost this extra piece! Combined, Adam and Kelly have worn Loop for over 24 months and have experienced time-in-range benefits, reduction of hypoglycemia, and less diabetes work. The table below shares some of the pros and cons we’ve observed with Loop. Fingerprint, Face ID, or password authentication required to bolus – in some ways safer than current pumps! Loop does not deliver automatic correction boluses, though it does correct for high glucose and underestimated carb counts via temp basals. When requested, Loop presents a suggested correction bolus to the user. The data below shares Adam’s CGM results from the 90 days immediately prior to using Loop in fall 2016 (left) and the most recent 90 days (right). It’s critical to note here that with Adam’s low-carb eating, Loop has driven little benefit during the day (Kelly points out there is not too much room for improvement! ); nighttime is where the biggest benefit has been. Overall, Adam and Kelly note that Loop is substantially less diabetes effort, guessing, and stress relative to what they were doing pre-Loop – in short, it delivers better outcomes with less work. The plots below for Adam show a tightening in all CGM values at all time points with Loop, though this does not show up in overall standard deviation. Adam’s time-in-range (70-140 mg/dl) has improved by one-hour/day on Loop, though this undersells the true quality of life benefit he has experienced. Depending on the open-loop period compared, the benefit has been more like 3-4 extra hours per day in range with less hypoglycemia. Adam was in the hospital for five days last month with a ruptured appendix, where he wore Loop and it worked flawlessly. As well, many patients can see even more improvement because like Kelly their starting Time in Range is much lower than Adam’s! Tidepool Loop represents a third, potentially disruptive pathway to bring AID through FDA and to market: as three individual, interoperable components. So far, two paths have been used in this area: Medtronic’s MiniMed 670G and Tandem’s Basal-IQ/Dexcom G6. In Medtronic’s case, it owns the CGM sensor, pump, and algorithm; ran a pivotal study; and submitted the 670G system as a PMA. In Tandem’s case, it took an academic algorithm (PLGS), embedded it on its t:slim X2 pump, and partnered with Dexcom as the CGM supplier; Tandem then submitted the entire system to FDA as a PMA, receiving approval for both G5 and G6 compatibility. Now, Tidepool plans to submit Loop as a standalone AID app/algorithm approved for use with compatible iPumps and iCGMs; rather than stitching things together and submitting the whole package, Tidepool can focus on Loop alone and the algorithm component of the entire system. Like the iCGM path, Tidepool will presumably need to keep Loop’s labeling updated for compatibility with whatever pumps/CGMs it will work with – this will obviously require working with device companies directly. However, Tidepool will theoretically not need a brand-new FDA submission every time it makes a change to the app or adds compatibility with another iPump/iCGM. We’re not sure if Loop, even under a de novo iController pathway, would still be considered a class III device. We’d guess it would be, though perhaps it would be down-classified to 510(k) with many special controls in place. One of the other big questions is what the special controls would be for an iController – what specifications will be required? How hard will it be for other algorithm developers to meet them? For pump and CGM companies, if all goes well here, Tidepool would offer another compelling option to launch with AID: make your device compatible with Loop, instead of internally building/partnering on AID directly. In other words, a new pump company that aims to launch in the US market could focus on being a supported component in Tidepool Loop, in effect “outsourcing” AID to Tidepool, once the app has proven reliable at scale. This could allow many younger, earlier companies to come out with compelling AID, but not need to engage in all the trials and regulatory investment. Loop is quite a compelling product in our experience (even with its DIY shortcomings; see below), which could make the iCGM and iPump paths even more appealing; for now, iCGM is only Dexcom’s G6, and iPump is theoretical (Tandem believes it will be first). How will patients segment between AID embedded in the pump (e.g., 670G) vs. AID running on the phone (e.g., Loop)? Pump companies are moving in both directions, and longer-term all the companies are moving to systems that at minimum allow for bolusing from a phone app. With systems like Bigfoot and Insulet and Lilly, the ultimate goal is for the phone to serve as a user interface (e.g., to check system status, to deliver a bolus), though the algorithm is embedded in the pump, meaning users will remain in closed loop when the phone is out of range. With Loop, the algorithm rests in the phone as a standalone component that communicates with the iPump/iCGM – this has the potential advantage of mix-and-match interoperability and potentially more iteration, but it also means closed loop stops running when the phone is out of range. Both approaches have pros and cons. We think that big picture this will expand the market for closed loop therapy, particularly given that many patients love the G6 and will appreciate an option with this CGM (we think this is the reason for the relative popularity, even as an unregulated approach, for Loop). For algorithm/app developers, Tidepool may forge a new regulatory path and open a world of software innovation in AID that exists outside of pump/CGM manufacturers. Historically, it has been difficult to imagine algorithm-only startups/players in automated insulin delivery, since pump companies owned the submission and embedded the algorithm in the pump. Now that the components can (theoretically) be submitted individually, we may see more innovation in this area – especially if Tidepool blazes a regulatory precedent for it. “For most people, their only option [to use Loop] is to buy an old, used Medtronic pump. We think that’s just not right. People should be able to use officially supported and commercially available pumps. We shouldn’t have to buy old, unsupported, out-of-warranty pumps on Craigslist, eBay, or Medwow to get great care.” We totally agree with this and we’re sure Medtronic will be very happy with this too. We’re sure Medtronic is not excited from a legal perspective alone with their pumps being used in this unregulated way – we are not sure from a liability perspective where Medtronic lands in the case of a safety issue though we have heard of none to date. “Not everyone is comfortable building and maintaining their own DIY system.” This is definitely true even at Close Concerns – Kelly’s husband John took responsibility for hers; Kelly had no interest (or time!) for set-up even though Adam found it fairly easy (but a couple hours!). Kelly had some technical problems with hers and wished out loud at those times for a 1-800-LOOP to call! “Many people with diabetes are not comfortable using a system that isn’t FDA cleared or approved. And many doctors and Certified Diabetes Educators (CDEs) are not willing to recommend a product to their patients that is not FDA cleared or approved. The FDA would really love for there to be an entity that takes responsibility for support and tracking of safety and efficacy, including “post-market surveillance” (the fancy term for “gathering and analyzing data to make sure a pharmaceutical drug or medical device is safe and effective after it ships”).” Although we didn’t personally have an issue with this (Kelly has taken lots of drugs off-label with the full support of her doctor), we did not feel great knowing that many patients were asking HCPs to support this and we felt this was a troubling position to put HCPs in given the scope of unknown support and liability. While we know one healthcare system where there is an incredible HCP who has put together over 80 people on Loop “off-campus” since it is not technically supported by the University, we think it’s asking a lot of health systems to absorb these costs and not to have anywhere for the patients to go except each other for support (though the system has been incredible and is a stellar example of peer to peer support done incredibly well). Why did Tidepool choose Loop and not OpenAPS? “We're big fans of both, and many of us at Tidepool have used both. OpenAPS, Loop and AndroidAPS have catalyzed all of this. At this point, our goal is to get something onto market quickly. Since so many of us at Tidepool are currently Loop users in our personal lives, we felt this was our best path to make the biggest difference in the shortest period of time.” We think it’s good they chose one rather than tried to do more than one.